South Beach in Miami or Venice Beach in Los Angeles? Which one would you choose to visit? Well, I didn't choose any of the above because of the obvious geographical issues. So, I chose Point Pleasant Beach on New Jersey's famous Jersey Shore. I am very pleased to say this beach enabled me to have a very relaxing sun-drenched afternoon, one which I desperately needed! Work has been hectic to say the least, so with my precious two days off around the corner, I decided to make the most of the sensational Jersey weather and go to the beach. New Jersey has recently been blessed with great weather. 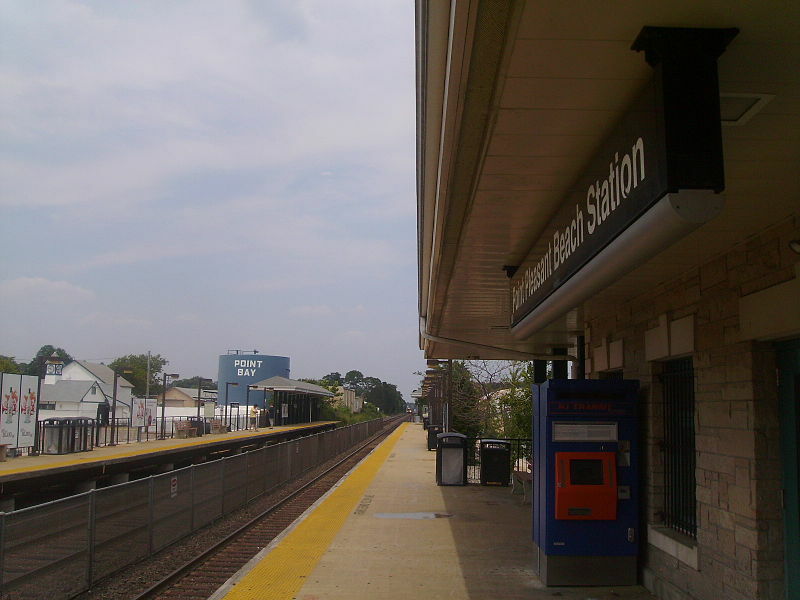 Throwing caution to the wind, this morning I jumped on the 10:02 NJ Transit train bound for Point Pleasant Beach Station via Long Branch. I almost forgot to take the essentials with me to the beach like sunscreen, so I dashed to Walgreens on the way to my local transport hub, Newark Penn Station. In my opinion my notebook, pen and camera seemed to be the most important things for me to pack, you could say I'm turning into a dedicated journalist. Who could possible want to write about a day out to the beach? Me!!! My Kuumba days have radiated into my real life endeavours. Matt Lazenby springs to mind. Enough reminiscing, let's go to the Beach, Beach! Green fields and picture postcard houses passed by before my eyes, this could only mean that the depressing site that is Newark was out of my life for a few hours at least. I'm such a hypocrite because when I arrive back in Newark I always feel a sense of belonging as its my home for now. The kitsch neighbourhood of Point Pleasant pleased me as it radiated a sense of seaside cuteness, please I make myself nauseous with my own way of describing things. Back to the script, I missed the earlier train from Newark so my plans were somewhat behind than what I previously estimated. I now see a bit of dis-organisation actually pays off as by 12 noon the weather on the Boardwalk was a staggering 36 degrees, a temperature which I would not complain about when at the beach. Taking my place on the quieter side of the beach, a point that was more than pleasant due to the scorching sun beaming down on the golden sand. Not being bitter but I paid $8.00 to spend three hours at the beach, slightly disheartened that I had to pay but my day wouldn't of been so good without my tanning time. The water was quite nice, but swimming was not on my agenda. Prepared with my factor 4 Hawaii'an Tropic sunscreen I cooked myself until it was time to cool off in the blue Jersey waters. Relaxing to the maximum the stresses of the last week were drifting away from my mind, I have a feeling next week might have to be another beach day to tan and chill-out. Coney Island anyone? I tried to imagine if the beaches in Puerto Rico match the beaches in New Jersey, as my vacation is only two months away. No offence Point Pleasant but I imagine Flamenco Beach makes Point Pleasant look totally different. This time last year I would have been making my day trip down to Miami, me and my Disney friends all had a great day there. Swimming in the crystal clear ocean blue, taking in the sites of South Beach. I look back at that time and think it would have just been nice if our stay in Miami was for a little bit longer. Let's not dwell on what we haven't got or in this case, what we didn't do because by all accounts my day at Point Pleasant Beach was amazing! Point Pleasant beach happened to be managed by a private company, officially known as Jenkinson's so now I understand why I paid to use the beach. 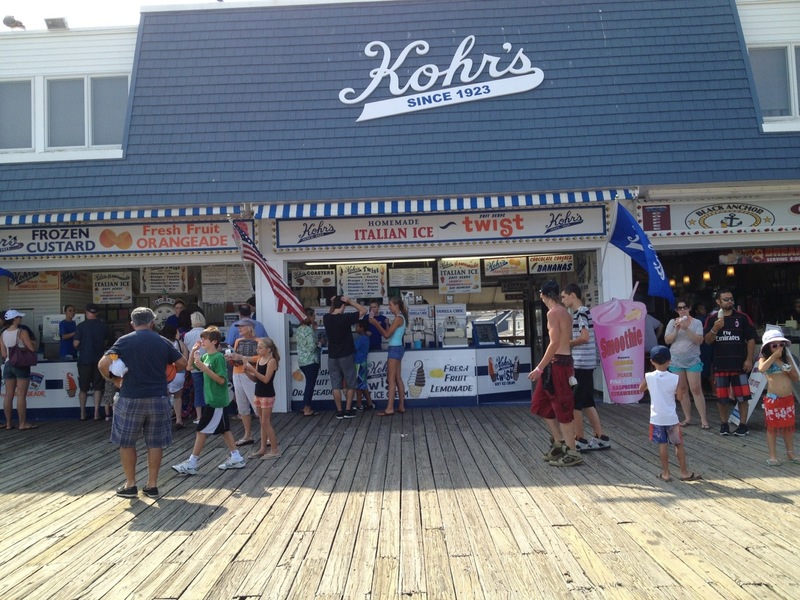 This company owns the boardwalk, which included the beach. I do wonder if I would have to pay at Coney Island for the same facilities? The fairground is also part of the business, I noticed a lot of children enjoying the rides that made up the fairground rides. 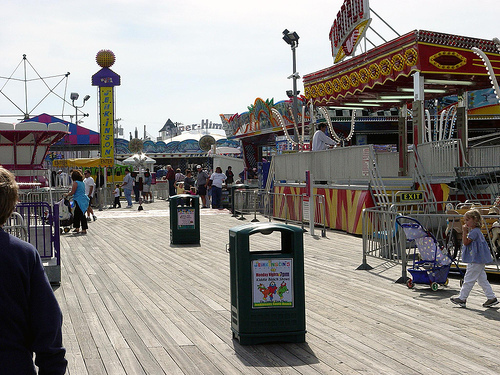 Everything looked really clean considering the beach, boardwalk and fairground were really busy during that summer's day. Visiting the beach in June fared to be a good idea because the crowds of people weren't too overbearing in the heat of the midday sun. I still don't agree with having to pay to use the beach but the convenience of the location for the beach from Newark was perfect, I don't think I have ever been to a beach where I could seamlessly get on a train from the next city! Come to think of it, my day at Point Pleasant Beach was probably my first ever American beach day! I know my negativity isn't the best way to note my day at the beach but I did have a great time! So, I say to the welcoming and quintessentially American Point Pleasant Beach to keep doing what you do! As my beach experience drew to a close I felt my day would of have been incomplete without a walk down the Boardwalk. I have to say the main feeling of the Boardwalk was that its quite tacky, in the end something made me look closer to appreciate its American charm. Ultimately, the deciding factor was the strawberry ice cream I enjoyed from Kohr's Ice Cream stand. The sites and the people that made their way down the Boardwalk gave it the character and individual seaside charm that made all of the components worked perfectly. 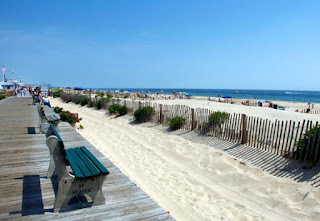 Point Pleasant Beach is a great beach to visit, having something for all of the family and an independent traveller like myself I left the beach very relaxed, ready to face another day at work. Would I visit Point Pleasant Beach again? That's a really good question because I probably wouldn't due to New Jersey and New York has so many other beaches to visit. I think my next beach trip will be in Puerto Rico, I have to make the best of this time here, so I don't want to choose somewhere that might ruin my string of luck! Listen to Nicki Minaj's latest jingle 'Starships' because it will take you to the Beach! Beach! Beach! Point Pleasant Beach Thank You for a Great Day! Really beautiful sharing! Your post is really big source for me to enjoy the upcoming summer vacations. I'm going to plan usa east coast tours and looking forward some ideas to make this tour more memorable. Now I'm happy to find the bundle of useful information in your post. Glad to hear a lot from you soon. Keep on sharing!